When will be Impractical Jokers UK next episode air date? Is Impractical Jokers UK renewed or cancelled? Where to countdown Impractical Jokers UK air dates? Is Impractical Jokers UK worth watching? Based on the hit US show, Impractical Jokers UK features four real-life best friends as they challenge each other to some of the most outrageous dares and uproarious stunts ever to be caught on hidden camera. Hidden camera comedy show as four friends challenge each other to ever greater public humiliation. Matt plays the nose-piano in a music shop, a quiet cafe is disturbed by fart noises, and then the guys must win a kiss from a stranger. The biggest loser faces a terrifying forfeit strapped to the top of an aeroplane. Hidden camera comedy show as four friends challenge each other to ever greater public humiliation. The guys plays a fun game of Touch the Stranger, give a presentation to a focus group, and work in a burrito bar. The week's biggest loser must compete in a rap battle! Hidden camera comedy show as four friends challenge each other to ever greater public humiliation. The Jokers conduct a survey about sweets, share secrets at a focus group and moonlight as shoe salesmen. Whoever comes last must teach a class of schoolchildren about spiders, using some huge, living specimens. Hidden camera comedy show as four friends challenge each other to ever greater public humiliation. The boys make mischief at the deli counter, attach balloons to passersby, try to convince phone users to give up their handsets and confront strangers about their social conduct. The loser will be forced to undergo a bruising ice hockey training session. 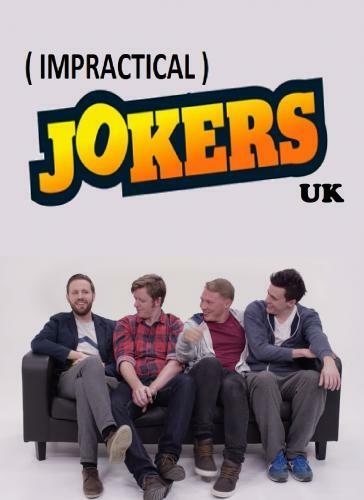 Impractical Jokers UK next episode air date provides TVMaze for you. EpisoDate.com is your TV show guide to Countdown Impractical Jokers UK Episode Air Dates and to stay in touch with Impractical Jokers UK next episode Air Date and your others favorite TV Shows. Add the shows you like to a "Watchlist" and let the site take it from there.